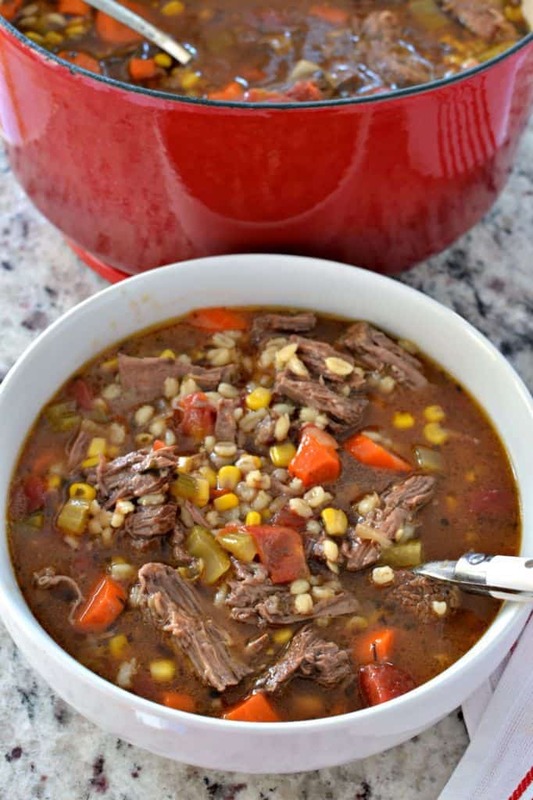 My husband and son are crazy about this Beef and Barley soup! They just can not get enough of it! I love soup. The cool days of Autumn are beginning to move in and there is just something wonderful and comforting about a nice big stockpot full of soup. Albeit if you are little crazy like me soup is good any time of the year. 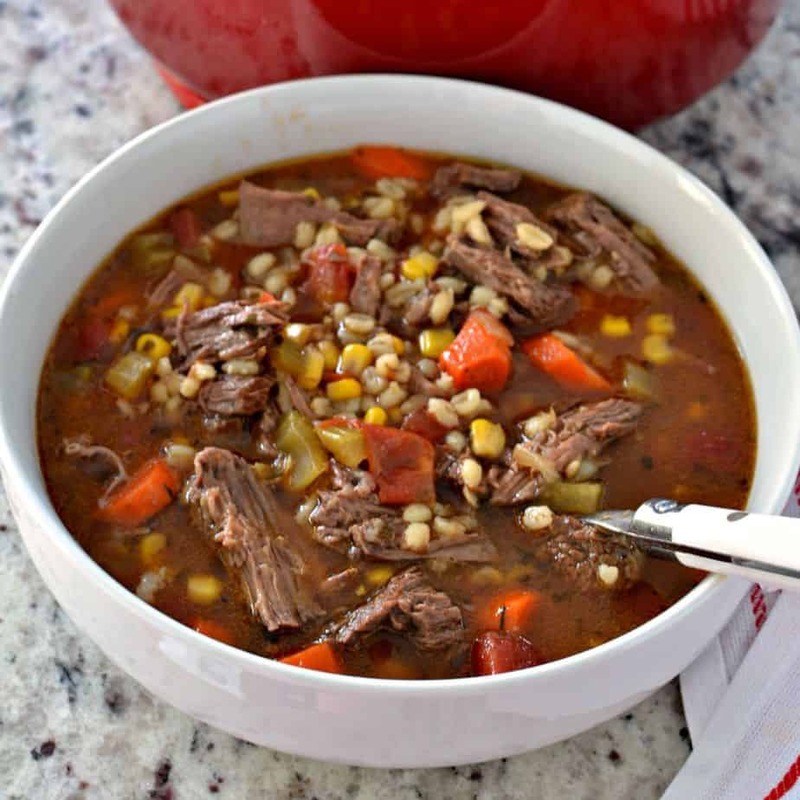 This Beef and Barley Soup is sure to become one of your families favorites. I have used both beef chuck roast (my preferred way) and stew meat. Both are delicious albeit a little different in the end result. You are sure to love the combination of beef, carrots, celery, onions, tomatoes, corn and barley in a deliciously seasoned beef broth. How can you argue with a scrumptious nutritious bowl of absolute goodness? What is barley and where can I find it? So you ask what is barley? Barley is a wonderfully versatile cereal grain with a rich nut like flavor and an appealing chewy, pasta-like consistency. In fact if you did not know better you would swear it was pasta. In most grocery stores it is in the soup aisle and is packed in a box about the same size as a pasta box. It simmers and swells just like pasta does in soup. There are two kinds, Medium Barley and Quick Barley. Medium Barley cooks in about forty-five minutes and Quick Barley cooks in about twelve minutes. I use the medium version with the chuck roast when things are more leisurely. I use the quick version with the stew meat when I am pressed for time. In a large stockpot or dutch oven add a little oil and brown the chuck roast or stew meat. Remove from the heat and add a little more oil. Add the carrots, onions and celery and cook for about five minutes. Stir in the garlic, parsley, oregano and thyme and cook for just a minute or so stirring constantly. Finally add the beef broth, diced tomatoes, bay leaf and beef back to the pot. Add the corn and the barley. Cook until the barley is tender. Use the medium barley with the chuck roast and it will take about 45 minutes for the barley to swell and be soft. Use the quick barley with the stew meat and it will take about 15 minutes for the barley to cook. Remove the roast from the pot and trim cutting the tender beef away from any gristle or fat. Cut or shred into bite size chunks and return to the pot. What cut of beef is best for Beef and Barley Soup? My personal favorite is the chuck roast. This cut is from the shoulder muscles. At first this cut will seem quite tough but over the course of cooking it will break down into succulent tender wonderfully flavored pieces of beef. The chuck roast derives a lot of its rich taste from the fat and the connective tissue. You can either cut the chuck into bite size pieces or better yet sear it, drop the whole chuck in the stockpot and let it simmer for a couple of hours. When it is fork tender remove it from the soup and trim it. Cutting the delicious meat away from the fat and unwanted gristle. Return those delicious bites of simmered beef back to the soup. Other cuts that you could use are Round roasts, rump roasts, and pot roasts. I have learned that various regions have different names for cuts of beef. Stew meat is by far the fastest but not always the tastiest. If you choose the stew meat start with pieces that are visually similar, are of a consistent size, and have a fair amount of white striping (fat and connective tissue) throughout as this will give it more flavor. Helpful hints on making this Beef and Barley Soup awesome. If you have the time use the chuck roast. It has more flavor and will be more tender. Sear the beef in a little oil. If you are preparing for company peel the carrots. They have a much nicer appearance peeled and after all food should be aesthetically appealing. Use low sodium beef broth so salt does not become the dominant seasoning. If you like a lot of flavor add plenty of fresh cracked pepper and a couple pinches of Cajun seasoning or cayenne pepper. Do not overcook the barley as it will get too mushy if allowed to simmer and simmer. This post was originally published October 10, 2016 and was republished November 14, 2018 with new content. 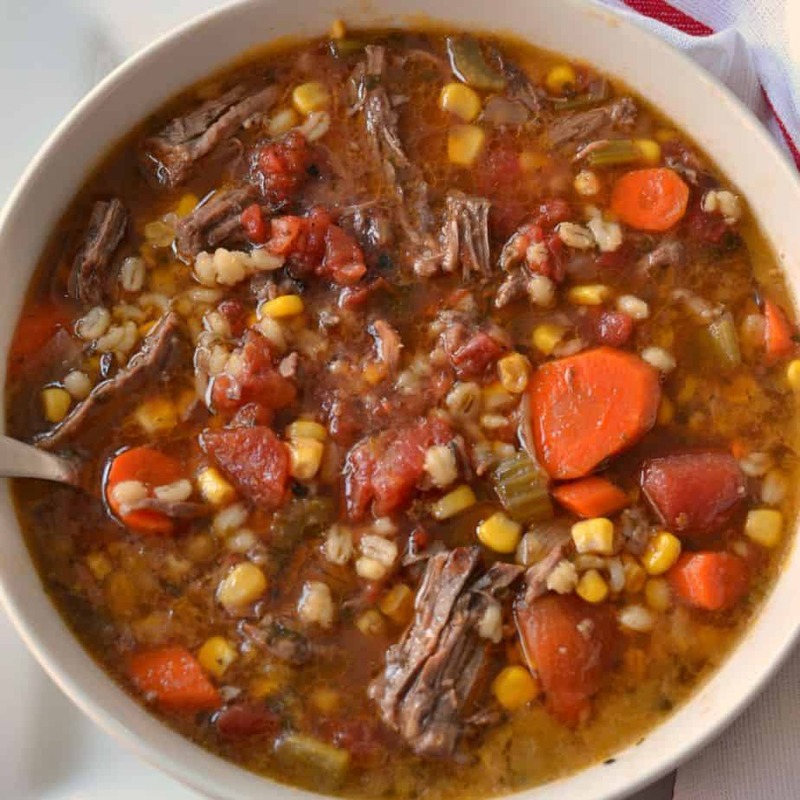 Beef and Barley Soup is a delectable combination of beef, carrots, celery, onions, tomatoes, corn and barley in a deliciously seasoned beef broth. In dutch oven or large stockpot heat vegetable oil over medium heat. Add beef and sear. Remove beef to a plate. Add carrots, celery, and onion and cook for 4-5 minutes. Add the garlic, parsley, oregano and thyme and cook for just 1 minute; stirring constantly. Add the beef broth, diced tomatoes, bay leaf and beef back to the pot. Reduce heat and simmer for 1 1/2 hours or until the roast is fork tender. Add barley and corn; cover with lid for 30 minutes. Remove lid and continue simmering for 15 minutes. Remove roast from the pot and trim cutting the beef away from any gristle or fat. Cut or shred into bite size chunks and return to the pot. If using beef stew and quick barley reduce the simmer time on the the beef to 20 minutes and the simmer time on the barley covered to 10 minutes and uncovered 5 minutes. I am curious to know if you were ever Smalltowngirl on aol. If you were then we were once online friends Doubtful but, possible Does the name Isadorea mean anything to you. I am not a stalker. Just wondering if I have found an old online acquaintance. MAking the soup tomorrow. I love barley. Sorry I was not that girl! However I love barley too! Regardless of that this is a truly great soup. I make a great beef barley soup. Well, I thought I did. Yours is the best I have ever eaten. Share it I will. Thanks Daniel! I am so glad that you like it! Thanks in advance for sharing the recipe! When using a Chuck roast when do you shred it all? Or did I miss something and you cooked the roast first? You are most correct Sarah. I am missing a step in that recipe. Thanks for the heads up. I will add it right now. Do you have a recipe for a homemade beef broth. I know about roasting the bones for flavour. Even shank meat is expensive now. Any ideas to keep costs down? I wish I did. Yes beef is very expensive. If I hear or see anything interesting I will let you know.